This paper describes how a typology was developed and used between 2008 and 2010 to investigate three different open educational resources (OER) initiatives in Sub Saharan Africa (SSA). The typology was first developed by careful scrutiny of the many OER and OER-related initiatives both globally and in Sub Saharan Africa. The typology was then both tested and further developed and refined by applying it to the TESSA, Thutong Portal and Rip-Mix-Learn initiatives. The typology uses four main categories - creation, organisation, dissemination and utilisation - and 18 sub categories to examine and analyse each initiative, with each sub category having a number of properties and possible dimensions. This typology was used to distinguish one type of OER initiative from another while grounding each in a wider context. As there are different levels of categorisation the typology is simple at the highest level, with just four elements, for use by practitioners; but is detailed enough at other levels to enable researchers to generate research questions. Furthermore the typology is flexible enough to evolve over time as it is applied to more and more OER initiatives both within and outside Africa and also as existing initiatives change and develop over time and while new initiatives emerge. The investigation of open educational resources (OER) initiatives requires rigorous appraisal based on theory as well as descriptions based on practice if we are to understand them and how they might be sustained. A robust yet flexible typology or classification scheme will enable better comparison of common elements over widely different OER initiatives and help inform and improve praxis at all levels and across all socio-economic and cultural systems. This in turn will help the variety of stakeholders to better understand what is happening and why. A wider objective for a typology is to develop a classification system that describes OER initiatives in a manner that is useful to researchers and practitioners from various disciplinary perspectives. However, the diversity of people within the OER community is very wide indeed. Some participants are educational theorists; others are educational practitioners (both students and instructors), educational technologists, ICT specialists, participants in governmental, inter-governmental, and non-governmental organizations, businesses, and the donor community. Catering to this level of diversity in devising a typology is a complex task. It risks either becoming so multi-faceted, with multiple categories, subcategories, properties and dimensions that its usefulness is reduced due to its complexity, or it risks being overly generalized with insufficient detail to be useful to the various OER community members it seeks to support. There is currently no single comprehensive, widely supported typology describing the broad OER movement. Those investigating the movement have tended to categorize OER based on a single category (perhaps with related sub-categories) that is of primary importance to their area of interest. For example, educationalists tend to focus on the pedagogical considerations of the development and use of OER while ICT specialists tend to focus on the technical tools required to support OER. Likewise, there are those who tend to focus on issues of policy, legal frameworks and licensing, business modelling, awareness raising, development agendas, or philosophical perspectives (such as the notions of 'freedom' and 'openness') and so on. Yet others are now talking about open educational practices and open educational services as well as OER . It may be that creating a single typology applicable to the whole OER movement that covers every aspect, or fits every circumstance, may not be possible. However, establishing some broad and common ground in a classification scheme will support the goal of facilitating interdisciplinary research agendas and a multi-sectoral approach to the implementation of OER initiatives. This paper describes how one such typology was developed and used between 2008 and 2010 as part of a doctoral study (Bateman, 2011) to investigate three different open educational resources initiatives in Sub Saharan Africa (SSA). The typology was first developed by careful scrutiny of the many OER and OER-related initiatives both globally and in SSA. The typology was then both tested and further developed and refined by applying it to the TESSA, Thutong Portal and Rip, Mix, Learn initiatives at their then state of maturity. While developed in one context it is hoped it has relevance to other parts of the world. Sub Saharan Africa was chosen as the context for developing this typology because of the potential that OER might offer the development of higher education (HE) in Africa. 'Knowledge' has become a key component of successful economic, social and cultural development for a globalized world. Higher Education Institutions (HEIs) in Africa, as focal points for innovation and the creation, organization, dissemination and use of knowledge, are making every effort to be at the forefront of these developments. HE systems, particularly universities and the ministries that support them, continue to strive to take the lead by developing policies and standards that actively promote Africa's participation in the global knowledge discourse (Sawyerr, 2004). One factor inhibiting HEIs' potential as catalysts for development in Africa is the lack of innovative, alternative methods of instruction currently offered. For example, African HEIs which incorporate Open, Distance and eLearning (ODeL) methodologies and technologies into their curriculum in an effort to increase access to HE are uncommon (Bateman and Murray, 2004). The explanation most often cited for this is a lack of technical infrastructure. Yet access to innovative learning methodologies goes far beyond access to technical infrastructure alone. Issues concerning awareness raising, faculty support, materials development, localization, adaptation, translation, intellectual property, quality assurance, standards, and financial sustainability all require scrutiny in terms of increasing access to quality, affordable and relevant higher education and training. Those involved in the OER movement early on tended to think of its origins as an extension of the online education model (Johnstone, 2005; Hylén 2005). That is, a model that delivered education and training using materials (usually digitalized, though not exclusively) that could be used anywhere, anytime by anyone for no cost. However they soon came to realize that such a description risks oversimplifying the nascent OER movement. In identifying how OER might contribute to HE in the future, the story of how OER came to be requires further reflection. Though it bears similarities to its main predecessors, namely, the Open Access movement, the Open Education movement, the Free/Libre and Open Source Software (FLOSS) movement and the related 'copyleft' movement of the late 1990s, its genesis is a result of none of these in isolation. Rather, it is the progeny of several convergent developments. The idea of OER was born of technological advances enabling the creation, organization, dissemination and utilization of educational resources, the notion that access to education is a right, and of a paradigmatic shift in the intellectual copyright movement that increasingly enables and encourages others to benefit from the production of knowledge resources at little or no additional cost (Atkins et al, 2007; OLCOS Roadmap, 2007). In short, OER can contribute to the learning process what educators across the globe value as a guiding principle: a willingness to share knowledge. However, issues remain which threaten to undermine the OER movement's expansion not just in Africa but across the globe. In his influential work, 'Pedagogy of the Oppressed', Paulo Freire (1970) outlines what he considers to be a flawed perception which he feels can act as an obstacle when it comes to providing a meaningful educational environment. The perception is of education as a 'banking structure' where the teacher is the depositor of information and the student is the repository for it. An educational environment that lacks an interactive, or as Freire characterized it, 'problem-posing' atmosphere where the transmission of knowledge is multi-directional rather than uni-directional, cannot justifiably be considered education, rather, it is indoctrination. Instead of being emancipated, the learner is oppressed. The promise of OER does not reside solely in the resources themselves, but also in developing the conceptual framework and methodological approaches that organize, manage and ascribe meaning to them in a variety of educational environments. As a result of its relatively late ingress into the OER movement, Africa entered the arena having little to no experience in the OER movement and with an undefined OER trajectory. Consequently, there is a need to mitigate a very real possibility that African HEIs may tend to participate as unequal recipients of content with little control over its origin, quality and appropriateness. By investigating African OER initiatives through a typological framework it highlights the particular concerns and contexts against the wider movement and in future may enable other institutions to participate actively so that they drive and own the process in terms of its form, content, quality, structure and orientation (Keats, 2003) but at that same time provide a typology that can be applied or adapted for other regions and contexts. It also led to the identification of potential sub-categories. Next, and perhaps most significantly - the OER typology was heavily informed (and tested) through the use of the same categorizations and emerging sub categorisations to analyse three case study narratives produced for the doctoral thesis (Bateman, 2011) on which this paper is based. These narratives were developed through a pattern matching technique that was structured according to the 4 main coding elements contained in the initial OER typology noted above. Thus the approach used was to iteratively apply the OER typology to several case studies in the SSA context in an attempt to ascertain how and why certain elements were contained within them and what the implications were for further iterations of the OER typology. With this in mind the entire set of typological elements were applied to each of the case studies to ensure complete coverage of all the identifiable elements that each case exposed and to allow for additional elements that could usefully be added to future iterations of the OER typology. The data that informed this iterative process included the coding of semi structured interviews with key personnel involved in the 3 initiatives and a large body of white and grey literature and documentation produced by the initiatives themselves, including their websites. This enabled a narrative account to be made of each case study that was informed by, and equally informed, the classification scheme. At the time of the study there were signs that several valuable OER initiatives were forming across Africa, emanating both from Africa itself and in partnership with OER initiatives abroad. While most of these initiatives were still new, there was, and still is, immense interest in the potential of OER to support and enhance Higher Education in Africa. However, there was a risk that as the various initiatives took shape there may be some that duplicate and perhaps even conflict with others resulting in a less than effective model for analysing OER emerging. The TESSA (Teacher Education in Sub-Saharan Africa) Programme is an ongoing research and development programme that aims to sustain an Africa-wide consortium that aims to improve access to, and raise the quality of, all aspects of teacher education and training. 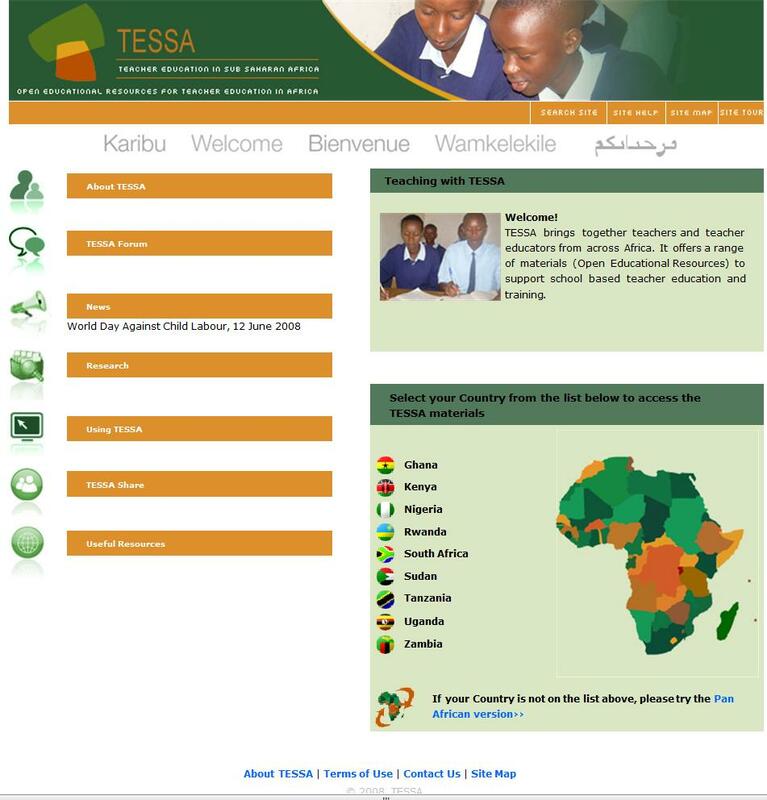 The analysis covers the initial phase of the TESSA programme implementation that commenced in 2005 and ended in August 2008 which aimed to: create a bank of 'open content' multi-media resources in on-line and traditional text formats that will support school based education and training for teachers working in the primary education sector; develop 'open content' support resources for teacher educators and trainers who will be planning, implementing and evaluating the use of the resources developed above; effectively extend and widen the take-up and use of the TESSA resources and ideas across SSA; and implement research activities that would promote the improvement of teacher education generally, in particular school based teacher education in SSA. The programme was established as a result of more than ten years of co-operative partnerships undertaken through a variety of projects that were consolidated to form TESSA's founding consortium partner network of 16 institutions in 9 countries. By the end of the initial phase, over 100 academics and over 1,000 teachers had been involved in the design of the programme. The bank of open content resulting from all this activity was accessible through a portal (Figure 1). The idea of the Thutong Education Portal was introduced as part of a comprehensive e-Education Strategy developed by the South African Government in 2004 with development supported and managed by the Department of Education, starting in 2005 and redeveloped in 2008. The Department described the broader context within which the portal was to function as revolving around the use of ICT to accelerate the achievement of national education goals; connecting learners to other learners, teachers to professional support services and providing platforms for learning; that would result in better information and ideas being shared via effective combinations of pedagogy and technology. Thutong's approach to authoring OER was to look first at the needs of teachers and students in clearly identified sectors of the South African education system. Somewhat unique among OER repositories around the world, the Thutong portal emphasized the learning outcomes that the educational resources aimed to support for each subject area rather than adopting the content focus more common in other repositories. 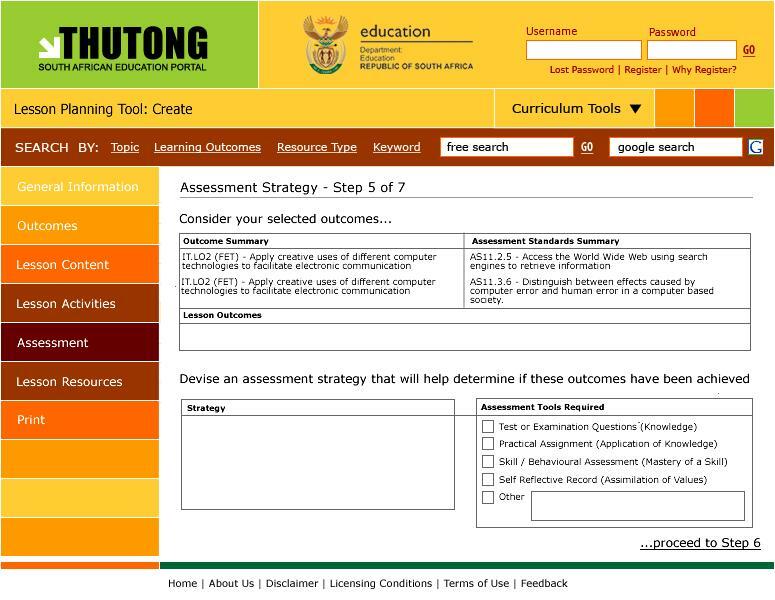 With this in mind, and in the context of the Thutong portal, an educational resource was defined as 'a resource that specifically seeks to describe the teaching and learning pathways and processes that learners should work through in order to achieve identified Learning Outcomes and/or Assessment Standards'(Figure 2). 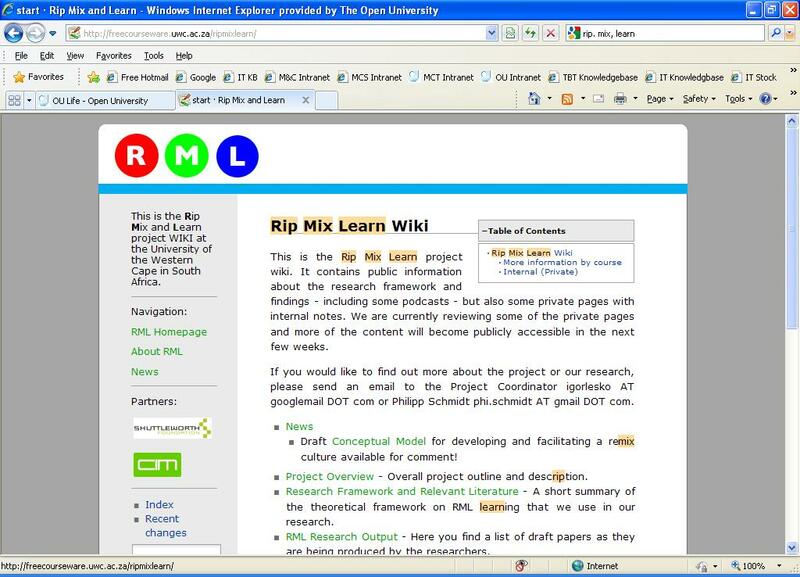 The Rip-Mix-Learn project was launched as a practice based research initiative at the University of the Western Cape from June 2007 to May 2008. It was one of a handful of OER initiatives in the world that looked at the role of student involvement in the creation of OER (Figure 3). The components of the title refer to the approach adopted to generate the OER and the pedagogical implications for students when doing so. "Rip" refers to locating the digital materials to incorporate. "Mix" refers to the digital tools used to manipulate the digital information. "Learn" in this context refers to what happens when students, as 'Ripper-Mixers', use Web 2.0 applications to actively produce their own knowledge, rather than being passive consumers of information prepared for them. As noted earlier, using the initial four broad categories outlined earlier, 18 sub-categories along with several properties for each sub-category were established through an iterative process guided by the analysis of the three case study OER initiatives. The final categorizations that emerged from this process are presented in Table 1. The hierarchically arranged classification variables within the table are described as 'Category' (first level), 'Sub-Category' (second level), 'Property' (third level) and 'Possible Dimension' (this fourth level detailing the dimensions or elements that contribute to a property is not shown here for clarity). The inclusion of the various descriptors involved a process of identifying the 'OER movement' as a phenomenon and classifying the elements from which it is comprised, noting that some properties contribute to more than sub-category, highlighting the interrelatedness of them. The typology could therefore be used to distinguish one type of OER initiative from another while grounding each in a wider context. For example, initially the TESSA Programme concentrated almost entirely on the 'Creation of OERs' while the Thutong Portal concentrated its activities primarily around the 'Organization of OER' in that it has spent a great deal of time and energy on the portal storage mechanisms. In other words the elements included in the typology can be used to describe various OER initiatives that exist within the wider OER movement regardless of their particular emphasis or approach. It is hoped that it may also be used to inform and guide the development of nascent OER initiatives as they examine the various components they may need to consider during their formation. Previously, categorizations such as policy framework, interoperability, licensing framework, remix potential and the like were used to define OER initiatives at a broad level. However, as previously discussed, these are not appropriate categorization variables that can serve either interdisciplinary research agendas or multi-stakeholder participation because they tend to be too narrowly focused around single stakeholder areas of interest. The OER typology presented here involving various categories, subcategories, properties (and dimensions) was successfully used to describe and compare three diverse OER initiatives in SSA (Bateman, 2011), although it is not the intention that each and every typological element need be applied consistently to all OER initiatives. It is hoped that the typology is simple and pragmatic enough to provide for a basic understanding of the OER phenomenon by both researchers and practitioners. First, there are only four categories of involvement in the OER movement in the core typology: creation, organization, dissemination and utilization. In this way, the typology remains simple at the first-order level. This simplicity is intended to serve academics across various disciplines that need a unified view of the ecology of the OER movement in order to generate research questions. The typology is also a classification system that may be useful to researchers who seek to pursue programmatic research and theoretical advancement of the OER movement from a variety of disciplinary perspectives. It is therefore intended to serve practitioners who need to better grasp the various aspects of the OER phenomenon before they can meaningfully participate in the OER movement supported by appropriate levels of understanding. It is important to note that while the attributes of the OER movement included within the typology above are likely to be shared by various OER initiatives, none of individual OER initiatives studied here must possess all of the elements contained in the typology for either the typology or the case study narratives to remain valid. For example, in two of the three case studies (TESSA Programme and the Thutong Portal) it was evident that all these attributes could indeed be assigned. In the third case study (Rip-Mix-Learn initiative) this was not the case but this was due more to the early stages of the initiative's implementation than any marked digression from the typological categorizations. In this sense it may also indicate the 'maturity' of a particular initiative as it develops. As with any typology, it can be refined and is likely to evolve over time as the OER movement itself evolves. While the elements included in the typology can be used to describe or 'profile' initiatives regardless of their particular emphasis or approach, and as just noted none of the initiatives need possess all of the elements contained in the typology as long as they have all been considered. Even in the course of this study the typology evolved in several ways. For instance, in an early version, IPR issues were included as properties within another category (viz. that dealing with interoperability and compliance to support OER re-mix). When the coding of the primary source data for each case study was undertaken it became evident that this issue warranted more detailed attention and so it was moved to a higher level in the categorization in the typology (that of sub-category) and therefore also became a separate section in the analysis of the case studies. Similarly, an earlier version included 'Packaging' as an additional 'sub-category' in the typology. In the subsequent coding and analysis of the primary source data it was revealed that this element could be collapsed into an earlier category dealing with 'delivery methods for remote and local access to OER' and was therefore re-categorized (as a property) in the typology. This change was then reflected in the analysis as this issue no longer warranted a separate section. Notwithstanding its iterative nature, the current version of the typology served the purposes of this doctoral research study in that it did provide a framework within which to structure the case study reports in a meaningful and easy to comprehend manner. Inevitably, OER community members and researchers may continue to debate the relevance and appropriateness of the typology presented here. It is hoped that this debate will be enriched by knowledge generated from further empirical studies that are, at least in part, inspired by the typology. Indeed the relative immaturity of the case study initiatives used to test and refine the typology was a concern for both practitioners and researchers and it is no surprise that the studies main findings were that (a) greater investment was needed in capacity building, (b) more attention given to appropriate use of technology and pedagogy in higher educational systems and (c) more contextual research applicable to sub Saharan Africa to inform those decisions. While the typology itself is the main focus of this paper its iterative development did enable some specific findings to be drawn out about the OER movement in Sub Saharan Africa at that point in time when the analysis was undertaken. The research supported the view that a shift in thinking is required in the way HE is provided in SSA and that elements of the OER movement forming globally may be able to catalyze this shift. Further, this will need to be supported by adequate planning and resource provision, without which the ability of countries, institutions, educators and, indeed, the learners, to benefit from OER strategies and policies that will support the cost effective provision of quality HE programmes, will be severely curtailed. In any education system a supportive policy environment is essential to the success of improving education provision. This is particularly the case when it comes to informing and guiding the expansion of the OER movement that is aimed at contributing to the levels of transformation required in SSA universities. The notion of 'openness' needs to become a key element of the policy discourse for countries in SSA that seek to improve educational quality within the institutions they govern in order to ensure that their development objectives are met. The main study (Bateman, 2011) on which this paper is based has demonstrated that the various categories, subcategories, properties and dimensions of the typology are descriptive of three diverse OER initiatives. For example, the case data strongly suggests that the issues arising when seeking to implement OER initiatives are indeed common across OER initiatives. This is evidenced in the fact that all of the data from the two main case studies (the TESSA programme and the Thutong Portal) could be structured according an identical classification scheme that used the same elements and properties. Since this doctoral study was carried out there have been many initiatives and developments that have indeed begun to address some of the issues for OER use in Sub Saharan Africa outlined earlier and to which the OER typology could be applied. This is particularly seen in the work of new initiatives such as OER Africa  and the combined efforts of existing organisations working in Africa, namely the African Virtual University , UNESCO and The Commonwealth of Learning. The latter two have recently developed Guidelines for OER in Higher Education developed together with the Commonwealth of Learning (UNESCO/COL, 2011) and launched an UNESCO OER Platform in November 2011 . Indeed bringing OER into policy discourse and development has been a critical part of developments in SSA and elsewhere around the world, as most recently shown in the 2012 Paris OER declaration . Miyagawa, S. (2005) Presentation on MIT OpenCourseWare at the 16-17 May 2005 Tokyo Ubiquitous Network Conference.